Getting an iPhone for Christmas? Download these apps! Update: we've added new apps to this list ready for Christmas 2018. You've unwrapped your shiny new iPhone, signed in with your Apple ID and you're ready to rock - but what exciting apps should you ask Silicon Santa to leave under your tech tree this Christmas? Don't worry, we're done with the festive puns. 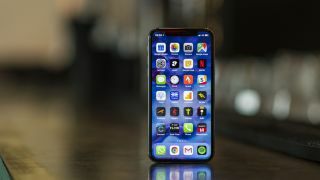 These are the must-have apps you should download on your new iPhone XS, XS Max, XR, iPhone 8, 8 Plus, 7 or 7 Plus. If you don’t listen to podcasts there’s never been a better time to start. And if you do listen to them, there’s never been a better way to do so than through Pocket Casts. This combines a slick interface with the ability to play on any number of devices – you can stream using AirPlay, Chromecast, Sonos or CarPlay, and there’s support for Android devices. Pocket Casts also has loads of advanced options, like the ability to trim silence, jump between chapters, and control playback from your Apple Watch, making this app even more desirable if you were lucky enough to unwrap an Apple Watch 4 this Christmas. Apple already has a password manager in the form of iCloud Keychain, but LastPass has it beat, especially if you use any non-Apple devices, as it’s cross-platform. LastPass also has plenty of extras, such as the ability to automatically generate strong passwords, and a secure notes area where you can hide away other sensitive details for easy - but secure - access later. You should definitely be using a password manager of some kind and LastPass is one of the very best options. If you like eBooks you need the Kindle app: it syncs automatically between iPhone and other devices so you’re always at the right place, it boasts a huge library of content, and a revamp has made it even nicer to spend time in that it once was. The iPhone’s Night Shift mode means reading in bed shouldn’t keep you up all night either. The iPhone's weather app is good, but if you'd rather have one that's evil then Carrot is the weather app for you: it tells you the weather in a cheerfully abusive manner, and you can fine tune the abuse to match your political views or tolerance for foul language. There's a fun AR feature, endless customization options and an excellent Apple Watch app and complication too. Download it now, meatbags! If you haven't been tempted by a paid-for iCloud subscription, there are several options for storing your shots in the cloud such as Flickr and Google Photos. Flickr's recent history doesn't make us too confident in its long-term future, but you can be pretty sure Google will still be around long after Earth has become a post-apocalyptic wasteland. You're getting free storage for all your pictures while helping to train Google's face and object recognition systems for the coming war on humans. Here's another app that's much better than Apple's one: Fantastical 2, which offers natural language input, effortless contact of invitees, geo-fenced reminders, snooze alerts and support for Google Maps and 1Password. It works happily with iCloud, Google Calendar, Yahoo and Exchange, its Today widget tells you everything you need to know without unlocking your phone, you can share events from apps such as Safari and we'd be genuinely lost without it. Apple's own messaging app is really good, but it's Apple-only and most of us have pals using other devices too. Enter WhatsApp, the world's favorite chat app: provided you're on Wi-Fi or have a generous mobile data allowance, you can send messages and media to anywhere in the world with the convenience of SMS and the cost of a thing that doesn't cost anything. The Maps app in iOS has got a lot smarter over time and can tell you what bus to catch from where (as can Google Maps), but when it comes to mastering public transport in the world's biggest cities Citymapper is the app you need. It combines multiple feeds from different public transit agencies to work out the most efficient route, compares the cost with Uber and even tells you the best bit of the platform to stand at while you wait. The mobile web is often an awful place, with pages hiding behind endless ads while sites track you all around the internet. Better Blocker plugs into your mobile Safari to banish the trackers, protect your privacy and eliminate user-unfriendly advertising. Rather than a block-everything approach it tries to enforce what it calls Ethical Design, and you can unblock sites you want to support. Ad-funded websites deserve to make a living, but they don't deserve to invade your privacy. Apple has a tendency to add features you've seen elsewhere, so Safari's save-for-later reading list feature has echoes of similar apps such as Instapaper and Pocket. But Pocket remains a useful app in its own right: it's multi-platform, has a great layout, integrates with your browser and your favorite social media apps and identifies things you're likely to be interested in. If you're still emailing interesting things to yourself, get Pocket instead. Google's fast, free and, er, filter-y photo editor can transform your images in ways the default Photos app can only imagine. There's lots of fun stuff in Snapseed, and plenty for the pros too, including curves and RAW editing. It's a particularly good companion for the iPhone XS and iPhone X ranges, whose cameras already take superlative shots. That plus Snapseed can make magic. You may already know the wonderful VLC as one of the very best video apps for Mac or PC, a Swiss Army Knife that can play formats we haven't even heard of and do all kinds of cool things to them. The iOS version of VLC is just as wonderful. The main draw is its ability to play media without first having to convert it, but it also streams from everything and works with all the major file sharing platforms. Steve Jobs famously told the creators of Dropbox that their service was a feature that could easily be duplicated, but while iCloud Drive does a reasonable job of storage it doesn't have the super-fast cross-platform, cross-device file syncing Dropbox offers. The free storage isn't as generous as some rivals but the sharing is effortless and the iOS app makes it easy to keep on top of the things that matter. There's automatic photo uploading if you want it too. When the tweeting gets tough, the tough turn to Tweetbot. Unlike the official Twitter app, which is a wretched hive of villainy, Tweetbot is a civilizing influence. You can mute by user, hashtag, source or keywords; sync between iOS and Mac; see who's liking and retweeting you; and basically do Twitter like a boss. Leaving Tweetbot for lesser apps is rather like taking a shovel and bashing yourself repeatedly in the face with it, and not in a good way. Get the garlic and the wooden crosses out: we're recommending a Microsoft app! And we're doing so because OneNote is really, really good. It works best if you're also using it on other devices - it's built around syncing - but it's a perfectly great stand-alone notes app too, and it really benefits from the larger screens of the iPhones Plus and X. It's a to-do app, a project planning app, a study app… if it involves organizing information, OneNote is the app to do it in. They may appear to be slightly less nice than Darth Vader, have the HR policies of Attila The Hun and be not so secretly planning to sack all the drivers and replace them with robots, but there's no denying that Uber has completely shaken up the people-driving-you-around-in-cars business. If you need to go somewhere Uber gets you there very efficiently, and the app is great. Another Microsoft app? Oh yes, and while this one doesn't quite come with the whole-hearted recommendation we'd give OneNote - it can often be choppy and drops calls far too often for our liking - Skype remains a crucial app for communicating over the internet, especially for work communications. We use it all the time and the iPhone app is much nicer than the desktop one, with really good clarity from microphone and speaker alike.